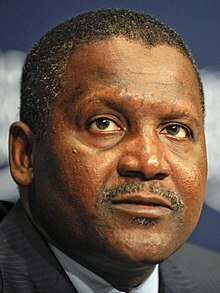 ^ The World's Billionaires #43 Aliko Dangote. Forbes.com. 3 March 2011 [2010-04-11]. ^ Aliko Dangote: The Ultimate Volume Player. Newswatch (Lagos). 1998年6月29日 [2010-03-02]. （原始内容存档于2009年2月10日）. ^ Aliko Dangote's Profile page. Forbes. [26 November 2011]. ^ Africa's 40 Richest People. Forbes. [15 January 2013]. ^ 8.0 8.1 尼日利亚“大人物”成非洲首富(1). 人民网. 2011年11月22日.